Below we take a look at Katusha-Alpecin. 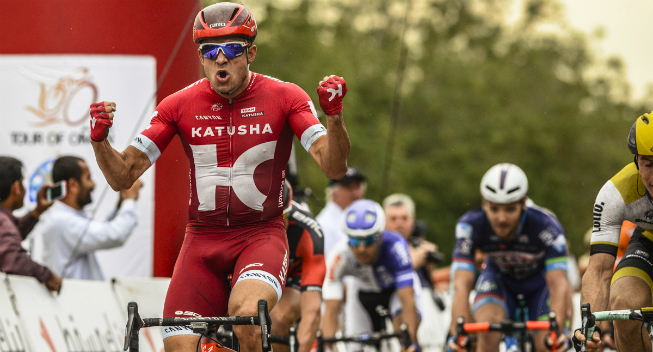 Last year Katusha announced that they would try to become a more international team and distance themselves from their Russian roots. The new identity slowly came through in 2016 but the major overhaul will come when the riders turn up for the 2017 season. German sponsor Alpecin has come in to support them and the team will have a Swiss license in the coming season. At the same time, 12 riders will be leaving while 10 new additions have been signed. None of the new riders are Russian but nine of the departing riders are from the former home country of the team. That’s a clear indication of the shift in mentality which is further underlined by the fact that the general manager will now be Portuguese Jose Azevedo who replaces Russian Viacheslav Ekimov. Even though the team was Russian in 2016, only one of their three leaders were from the biggest country in the world and as the team have retained two of their captains, there won’t be any major changes at the top of the hierarchy. In 2016, Alexander Kristoff led the team in the sprints and on the cobbles while Joaquim Rodriguez and Ilnur Zakarin shared the leadership in the hilly classics and stage races. The end of the relationship between Rodriguez and Katusha was painful and the Spaniard will no longer lead the team in 2017. As the team haven’t signed a real replacement for the stage races, Zakarin will now be the clear stage race captain as he again teams up with Kristoff at the helm of the squad. It’s slightly surprising that the team haven’t made an attempt to sign a replacement for Rodriguez as it will be hard for the team to maintain their top position in the WorldTour standings with just one grand tour leader. Most of the new signings are domestiques or young talents who can’t be expected to achieve results in 2017 and so the loss of the Spaniard will be dearly felt. In general, the team seems to turn its attention to the classics and the sprints as most of the signings are designed to strengthen the group around Kristoff. The only big-name signing is Tony Martin and at the time they put pen to paper, it looked like that was going to be a bit of a gamble. Martin had very bad 2015 and 2016 seasons and looked like he had lost the edge in the time trials. However, the return to his old TT position on the bike seems to have done him good. He looked like his former self when he dominated the two time trials at the Worlds and if he is indeed back to his best, he will be a big asset. In 2017, he targets the classics where he will be a very valuable rider for Kristoff and capable of achieving his own results, and the opening time trial at the Tour de France. At the same time, he may win a few time trials and do well in short stage races that are not too hilly. In addition to Martin, the group around Kristoff has been strengthened by the addition of Rick Zabel and Baptiste Planckaert. The latter is a very interesting addition as he had a bit of a breakthrough in 2016. After years of steady progress, he won lots of races against WorldTour riders and he proved that he can do well in tough classics condition. The plan is to have him as a second sprinter to replace Alexander Porsev who will leave the team, and he should be more successful that the Russian as he can also be there in the harder races. He will also be a very valuable support rider for Kristoff on the cobbles. Zabel is also a fast rider but it is now evident that he will never be a new Erik. He will probably mainly play a role in Kristoff’s lead-out train. The team have also added a few riders for the hilly classics but none of them are of Martin’s caliber. Maurits Lammertink, however, is a very interesting rider for the Ardennes. In 2016, he was one of the strongest riders in the Amstel Gold Race and Brabantse Pijl. He won’t be there in the harder races like Liege and Fleche but in the hilly races that are suited to fast finishers and puncheurs he has a solid potential. That was also evident at the Tour de Luxembourg where he beat Philippe Gilbert. The team have also signed the versatile Jose Goncalves who can do almost everything. He is fast, he climbs well and he has a decent time trial. He can play a role as a domestique and stage hunter in grand tours and he can be another option in the hilly classics. For the stage races, the team have added two domestiques. It’s a shame to see how Robert Kiserlovski has gone from a top 10 finisher in the grand tours to an anonymous helper. It is a bit of a gamble for the team to have signed him as he seems to get worse from year to year. However, we know that he has a decent potential and the plan is that he will be a valuable support rider for Ilnur Zakarin in the mountains. Reto Hollenstein has been added as an all-round rider who can help in the classics and the stage races. The Swiss is also strong in short time trials and so he may get his chance to ride for GC in lumpy races like the Belgium Tour and the Eneco Tour. The final signings are all young talents, most notably former U23 World Time Trial Champion Mads Würtz Schmidt and the current champion in that discipline Marco Mathis. Until now, the former has shown the highest level as he has proved that he can also challenge the pro riders at the Tour of Denmark. The Dane will use the year to develop and maybe take his chance in a smaller stage race. Finally, Jenthe Biermans has been added as a future rider for the cobbled classics. As said, the team have waved goodbye to most of the Russian riders of which many have signed with Gazprom-Rusvelo. On paper, the biggest losses among those riders are Sergei Chernetckii, Egor Silin, Posev and Anton Vorobyev. At the Tour de Suisse, Chernetckii was finally starting to show the consistency that could make him competitive in shorter stage races and Silin was amazing in the mountains at the Vuelta. Porsev was the team’s second sprinter and one of the most consistent top 10 finishers at the Giro. Vorobyev is a former U23 world time trial champion and even though the start to his pro career has been turbulent, his brutally strong performance at Circuit Cycliste Sarthe proved that he had deserved another chance at the highest level. However, the biggest loss is definitely Jacopo Guarnieri and it is a bit of a mystery how they could let the Italian go. Guarnieri has developed into one of the very best lead-out men in the world and he was instrumental in many of Kristoff’s victories. His absence will be dearly felt and the lead-out train will be a lot weaker. The team have also waved goodbye to Jurgen Van Den Broeck. On paper, it may look like a big loss but during his only year in the team, the Belgian didn’t give any indications of a possible return to his former level. During the last three years, Alexander Kristoff has won two monuments for the team and so it is only right that the first months of the year will be all about the reliable Norwegian. Among the big classics riders, Kristoff is probably the only one to do almost the full schedule from Omloop Het Nieuwsblad to Paris-Roubaix. The Norwegian is usually at the start of Omloop Het Nieuwsblad, Kuurne-Brussels-Kuurne, Milan-Sanremo, E3 Harelbeke, Gent-Wevelgem, Tour of Flanders, Scheldeprijs and Paris-Roubaix and he even adds Paris-Nice and 3 Days of De Panne as stage races along the way. The only two classics that he usually skips are Strade Bianche and Dwars door Vlaanderen. He will never be in contention in the former race but with the latter also moving to the WorldTour, he may add that to his schedule as well. If that’s the case, Kristoff could be at the start of nine major one-day races in a very short period of time and amazingly, he will be one of the favourites for all of them. Kristoff has never been that good in the opening weekend even though he is a former winner of Kuurne-Brussels-Kuurne. However, we can expect him to fire on all cylinders from Milan-Sanremo where he will be one of the big favourites. Kristoff is probably the fastest rider in the world at the end of the longest races and if he hadn’t started his sprint too early in 2015, he would have been a double winner of the Italian classic. Unfortunately, he didn’t sprint that well in 2016 and we have a little fear that he has lost the top-end speed for the first monument of the season. E3 Harelbeke has never suited Kristoff that well as he usually needs a longer distance to be competitive in the hardest of the Flemish races but he can win both Gent-Wevelgem and the Tour of Flanders. He failed to reach his best level in 2016 but if he can return to the lofty heights of 2015, he can do almost everything in those races in Belgium. Paris-Roubaix has never been a love affair for the Norwegian but in theory there is no reason that he can’t win that race too. Kristoff will be the undisputed leader of the team but Tony Martin also has ambitions for the cobbled races in what will be his second attempt. He will probably be a bit more of a wildcard who can take his chance in Flanders or Roubaix with long-distance attacks. That can be important as Kristoff was remarkably isolated in the hard races in 2016 when he no longer had Luca Paolini at his side. With Martin out front or as a domestique, he will have a better chance. Viacheslav Kuznetsov and Marco Haller will also be looking to step up for their leader. With the loss of Joaquim Rodriguez – and Daniel Moreno one year ago – the team will be in difficulties in the hillier classics where they will have to be a lot more opportunistic. As said, Maurits Lammertink was one of the best in Brabantse Pijl and the Amstel Gold Race in 2016 and he should get his chance to lead the team in those races. Jose Goncalves could also do well in those races but the Portuguese is a bit inconsistent and lacks experience in Northern Europe. If the team wants a major result in Fleche Wallonne and Liege-Bastogne-Liege, they have to bring in Ilnur Zakarin. The Russian had a remarkable debut in Liege in 2016 as he was probably the best rider in the race. He missed out on the final move on the late cobbled climb where he was at a disadvantage due to his lower weight but on the real climbs, no one could match the Russian. He has proved that he can handle the distance and even though he is not a fast finisher, he will have options in La Doyenne. Goncalves could be a second option for that race. In the autumn, the team will again turn the attention to Kristoff. The Norwegian has won in Hamburg and Plouay and been on the podium in Quebec so he must be keen to go for results in those races. For the GP Montreal, the team will have to look to Lammertink. Finally, Zakarin can win Il Lombardia if he has come out of the Vuelta in good form. With the loss of Rodriguez, Katusha-Alpecin only have one GC rider for the grand tours and it will be up to Ilnur Zakarin to go for the podium in the biggest races. The Russian has made it clear that he will go for the Giro-Vuelta double and so the team is likely to focus fully on Alexander Kristoff at the Tour de France. Zakarin had his first attempt as a GC rider in last year’s Giro where he was sitting comfortably in fifth place with a real shot at the podium when he crashed out of the race. Even though the race ended as a big disappointment, it gave him the confidence that he can maintain his level for three weeks. He again proved his excellent talent by winning a mountain stage in the Tour de France and he was one of the very best climbers throughout the spring at races like Paris-Nice, Volta a Catalunya, Liege-Bastogne-Liege and Tour de Romandie. He is still work in progress and so we can expect him to be even stronger in 2017. He climbs well, he can time trial, he can handle cold conditions and he is very consistent. In general, he has all the skills to do well in this specific edition of the Italian race and it won’t even be impossible for him to win the race. It remains to be seen what team Zakarin will have around him but he should have a line-up that is fully devoted to him. As said, the team has done very little to strengthen their climbing potential so he should have most of the stage race riders at his side. Rein Taaramae is likely to be his lieutenant and he could also be supported by Alberto Losada, Tiago Machado, Robert Kiserlovski, Pavel Kochetkov and Jose Goncalves. Taaramae and Goncalves are also capable of going for a stage win but we expect the team to focus fully on Zakarin. At the Tour, it should be all for Kristoff. Unfortunately, the Norwegian hasn’t won a stage in the past two years and without Guarnieri, it won’t be any easier. However, the profiles of the stages haven’t been revealed yet and if there are a few harder finishes like the one in Bern at the 2016 Tour, Kristoff won’t be without a chance. The second goal at the Tour will be to win the opening time trial with Tony Martin. The race kicks off in Germany and so that day will be the most important of the year for the world champion. With his return to TT form at the end of the year, it’s not impossible that he will save the race for the team already on the first day. The team will play less of a role in the mountains but we won’t be surprised if the team lines up the talented Matvey Mamykin for his second grand tour. The Russian has a big climbing potential and even though he is not ready to win at that level yet, he will definitely be an aggressive character. In the Vuelta, the team will again back Zakarin fully. He has never done two grand tours for the GC but he seems to have the recovery skills to do so. On paper, the Spanish race should suit him well. He will probably have most of the Giro team at his side but the team may be strengthened by Martin who has often used the Vuelta to prepare for the Worlds. He will be one of the favourites for the time trial in the final week if he hasn't abandoned at that point. This year Katusha-Alpecin will be a team with very few winners and so most of their results will have to come from the three designated captains Alexander Kristoff, Ilnur Zakarin and Tony Martin. However, the team also have Simon Spilak who has been one of the best one-week stage racers in the last few years and the Slovenian will hope to bounce back after a bad 2016 season. Lammertink will be given the chance to lead the team at the Tour Down Under and if he travels to Australia in great form, he could kick the year off excellently for the team as the race suits him really well. Kristoff had hoped to take the first wins at the Tour of Qatar but he will ow have to alter the plans and start his season in a race that suits him less. By the time, the WorldTour stage races in Europe start, it will be up to Zakarin and Spilak to deliver the goods. Both have won one-week races at this level and remarkably Zakarin showed us in 2016 that his focus on the Giro is no hindrance for him to be competitive from Paris-Nice all the way to the end of the Italian grand tour. Zakarin can win almost every one-week race in the spring and Spilak can do so too as long as there is a hilly time trial. It still remains to be seen whether the Slovenian can get back to his best but if he can, Katusha-Alpecin will have lots of success from the start of Paris-Nice until the end of the Tour de Romandie. Rein Taaramae is a potential third leader in the stage races but the Estonian is very inconsistent and he doesn’t seem to be able to hold his form for a long time. Hence, he will probably focus on the grand tours. Kristoff is a real winning machine and even though he mainly focuses on the classics, he usually also wins a lot of other races throughout the first part of the year. Apart from the classics, he is likely to ride Paris-Nice, 3 Days of De Panne, Rund um den Finanzplatz, Tour of California plus Tour des Fjords and the Tour de Suisse and he should pick up wins consistently throughout that period. As said, Baptiste Planckaert will be the second sprinter and have a largely separate program. Even though he was strong in 2016, he may not be fully capable of winning sprints at WorldTour level. On the other hand, he has progressed steadily and if he can add a few extra percentages, he may be able to pick up a few wins along the way. Maurits Lammertink has proved that he can win hilly one-day races or short stage races without big climbs and much time trialling and he should be given the chance to lead on certain occasions. Jose Goncalves could also be given leadership in some of the hillier one-day races and shorter stage races and he should show himself somewhere. Matvey Mamykin had a difficult start to his pro career but by the time we got to his first grand tour at the Vuelta a Espana, he had adapted to the pace. The Russian probably launched the most attacks during the three weeks but he didn’t manage to finish it off. He clearly needs to avoid such a massive waste of energy before he can realistically win at this level but at least the race showed that he can be competitive in stage races and grand tours. He needs to improve his time trialling before he can go for GC but he definitely has the potential to impress the cycling world in mountain stages at the WorldTour level. Maurits Lammertink failed in his first attempt at the WorldTour level but after having matured in smaller teams, he is ready for another chance. We were very impressed by him at Brabantse Pijl and the Amstel Gold Race where he was stronger than the results showed and he went on to win the Tour de Luxembourg overall. He is a great uphill sprinter with a solid punch for the hilly classics. He is still not strong enough to be competitive in the hardest one-day races but he has the skills to deliver a surprise in the easiest of them. Mads Würtz Schmidt has already been junior and U23 world champion in the time trial and beaten WorldTour riders at the Tour of Denmark. At the same time, he has shown progress on shorter climbs and he finished on the podium in his home tour in Denmark in 2016. This is his first year at the highest level but he should be able to show himself in a few TTs and maybe in a short stage race that does not head into the mountains.